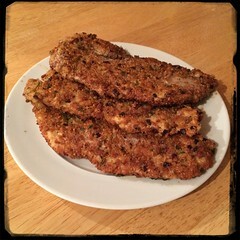 When made with homemade breadcrumbs, the basic cutlet turns into a very tasty item. 1. On medium-high, Pre-heat 3-4 tablespoons of 3/4 grapes oil and 1/4 olive oil in a frying pan. 3. fry until golden brown and flip to cook other side.